This is a defining element within any specification for a battery backup power system. How much load you want to power contributes towards the sizing of the system electronics and links to the battery backup time. The load size may be stated in terms of VA or Watts. VA takes into account the power factor of the load. For UPS systems, it is most common to measure a load in VA where as for energy storage Watts is the most common loading factor. To calculate the load in terms of VA or Watts, simply look at the rating labels on the back of the items to be protected and total them. Internet searches can also locate specification sheets and manuals that can provide such data. Otherwise it may be that a local UPS specialist can or electrical contractor can measure the amount of power being drawn. It is vital to ensure that any measurements are made at peak power usage to make sure a system is not undersized. It is also important to build in a growth factor of say 20-25% for future expansion. Domestic energy storage systems are available in a limited number of sizes from 3-10kW and so it is important to ensure that they are sized correctly. If a smaller system is to be installed for certain circuits within a house, there may be a need for these to be wired separately which can be more expensive than installing a system to cover the entire household. How long do you want to run for when the mains power fails? For a UPS system it may be a short duration and long enough to allow any connected automatic shutdown software to power down safely your IT loads. Longer backup periods may require either additional battery extension packs and/or a standby power generator. For domestic energy storage systems the amount of battery backup power will be more load dependent. This is because the typical energy storage products available in the market place are not designed for additional expansion. 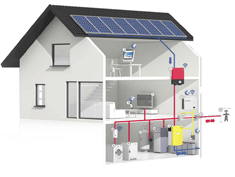 They are installed as self-contained systems with an inverter, charger and battery pack. How much backup power you get is load related. The lower the load, the longer you will get from the energy storage solution. Typical backup periods may be from 4-12hours (i.e. overnight duration). Another key difference between the two types of backup system: UPS and energy storage is the battery type. The batteries within UPS systems are typically used to provide standby power when the mains power fails or fluctuates. In an energy storage system the charge/discharge cycle may be more frequent. This may be down to the user using the stored energy to reduce their dependence on grid power at night rather than as a pure UPS system to protect them from mains power failures; which it will also do of course. So, in an uninterruptible power supply, the battery will typically be a Valve Regulated Lead Acid (VRLA) battery. In an energy storage system it will more likely be a Lithium-ion type battery. Lithium-ion batteries are better suited to frequent charge/discharge cycles where as VRLA batteries are more suited to standby power applications as with a UPS system. These are the two most common sources of backup power but there are several other energy storage technologies, though some of these are for larger, grid scale applications. The mains power may be a single phase or a three-phase supply. UPS systems are available for either but most energy storage systems are designed for single-phase voltage connections. It is important to match up the right system for the application in terms of phases, voltage and frequency. If the system runs from a three phase supply but power singles phase loads, the installation is more complex and will require some form of sub-distribution and possibly a more costly and complex electrical installation. Unless any system is ‘plug and play’, it will of course require installation by a suitably qualified electrician or electrical contractor. Other considerations could include: metering and remote monitoring. Metering is more relevant to energy storage systems, as it is important to measure the amount of electricity used from the storage system and ensure that there is no conflict with generation and usage meters. Metering may be less important for UPS systems unless they are used within an environment that monitors energy usage metrics such as data centres tracking Power Usage Efficiency (PUE). Monitoring is however a common element for both types of system. For a UPS system, we are typically looking at monitoring and control, including initiation of an orderly shutdown of connected IT systems. Monitoring may be via a local USB connection of SNMP and generally within the local IT network. For an energy storage platform, monitoring is important as most users want to check on the amount of energy storage and its usage. The monitoring system is generally linked via an Internet portal back to the manufacturer. This also provides the manufacturer with key performance data. For more information on specifying UPS systems and energy storage solutions please contact the Eco Power Projects team on 0800 612 7388 or email us.